The Cuba Solidarity Campaign extends its sympathy and solidarity to all those affected by Hurricane Irma which devastated many Caribbean islands this week. Cuban authorities are still assessing the full extent of the damage, but it is believed to be far worse than originally anticipated, with significant damage to infrastructure, tourist resorts and agriculture. Those wishing to donate to hurricane relief work can do so via the Cuba Solidarity Campaign Hurricane Irma Appeal – details below. The category 5 hurricane, the strongest on record for the last 100 years, tore along Cuba’s eastern and northern coast between 8-10 September. Winds of around 250km/h (156mph) and waves between 5-8 metres high have caused major damage to coastal communities, tourist resorts, agriculture and industry, taking out power and communication lines. Severe flooding in Havana and other towns has penetrated further inland than usual. In Havana the sea breached the malecon sea wall several blocks back into the city. Residents have been warned that waters may remain high for several days along hundreds of kilometres of coastline. Irma comes less than a year after Hurricane Matthew, a category 4 storm, devastated Cuba’s eastern provinces in October 2016, and many of these communities were still recovering from this when Irma hit. The full impact on the economy has yet to be judged, but it is feared that many of the all inclusive tourist resorts and farmland in central Cuba have been badly damaged with potentially devastating effects on the economy. The Jardines de Rey international airport, which served the all inclusive northern keys resorts, has been badly damaged, and more than 5,000 tourists evacuated from hotels in this area. President Raul Castro issued a statement on Sunday 10 September which said that tourist resorts would be restored before the start of the peak season in November: “We have the necessary human and material resources, as one of the main sources of income for the national economy. “It has been hard days for our people, who in only a few hours have seen how everything we have built with great effort has been struck down by a devastating hurricane. The pictures of the last hours are eloquent, as is the spirit of resistance and victory of our people who are reborn with every adversity,” he added. So far there have been no reports of hurricane related deaths in Cuba, although 26 people have died on other islands hit by the storm. This is mainly thanks to Cuba’s renowned hurricane preparedness programmes which have won praise from the United Nations as “a model in hurricane risk management.” Last year’s Hurricane Matthew didn’t kill anyone in Cuba, although it killed 271 people in nearby Haiti. In advance of Irma, one million Cubans were evacuated to shelters and higher ground for protection. Despite the damage and chaos caused by Irma, Cuba has continued its commitment to humanitarian support for other countries. More than 750 Cuban health workers have already arrived on other islands affected by Hurricane Irma, including Antigua & Barbuda, Dominica, Haiti, Saint Kitts & Nevis, Saint Lucia, and the Bahamas. 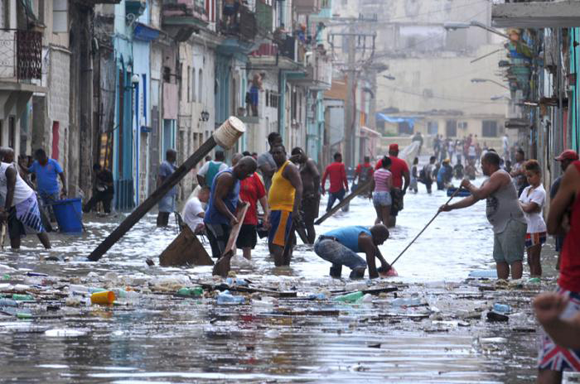 CSC sends its solidarity to the Cuban people in the mammoth task they have ahead to rebuild their communities. We call once again for the US government to end its inhumane blockade of the country so that the Cuban people can access the building materials and equipment they will need to rebuild their country following this tragedy. You can also donate online via our website here. Remember to mark “Irma Hurricane relief” in the message box.